Hey guys…I have no idea what I did to this photo, but I had to share it anyway. 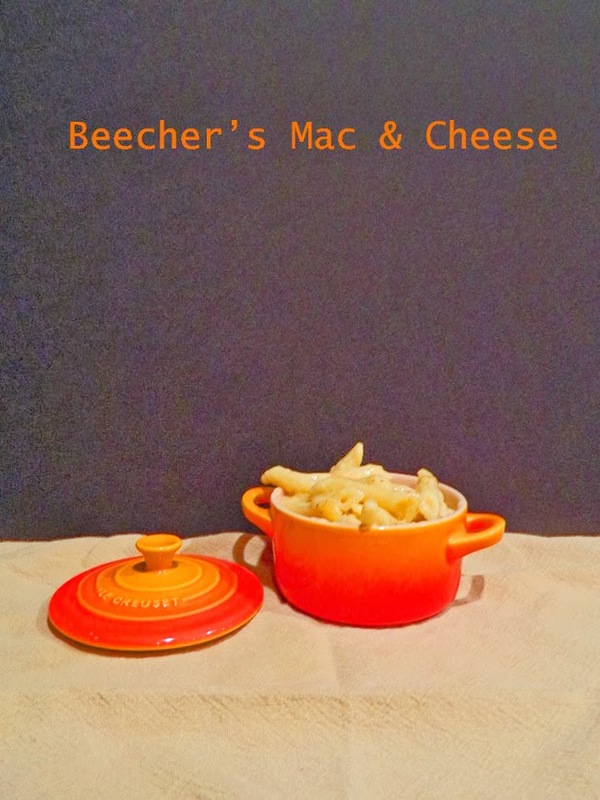 We are experiencing our first snowfall of the season and it's given me a hankering for Beecher's Mac & Cheese from the cool little shop in Pike Place Market in Seattle. 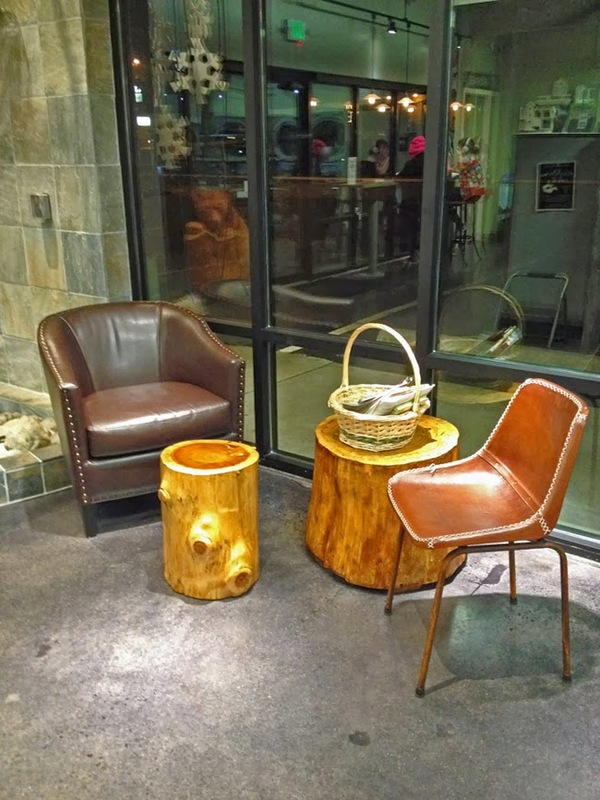 We were hugely excited to find their outpost in Seattle-Tacoma airport on one of travels and needless to say it's become a must stop, along with Caffe Vita for some delicious coffee art. Now you may not have heard of this dish, but after it was featured on Oprah's favorite things and touting itself as "Worlds Best Mac & Cheese" it became a hit in Seattle and beyond. My husband is a major cheese freak and I am someone that would never turn it down. And I am all for comfort food. When he found the recipe online it was a win-win for us both. 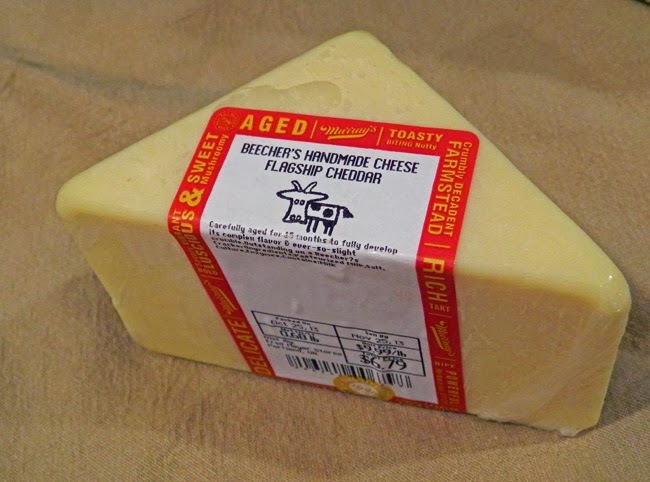 Beecher's cheese can be found in our local grocery store and he had built up quite a collection of it. So we were able to whip this up in an afternoon. I won't put up the recipe here…I'm honestly afraid I will bungle it since I am suffering from a sinus/headcold thing and I really shouldn't be near electronics at all. 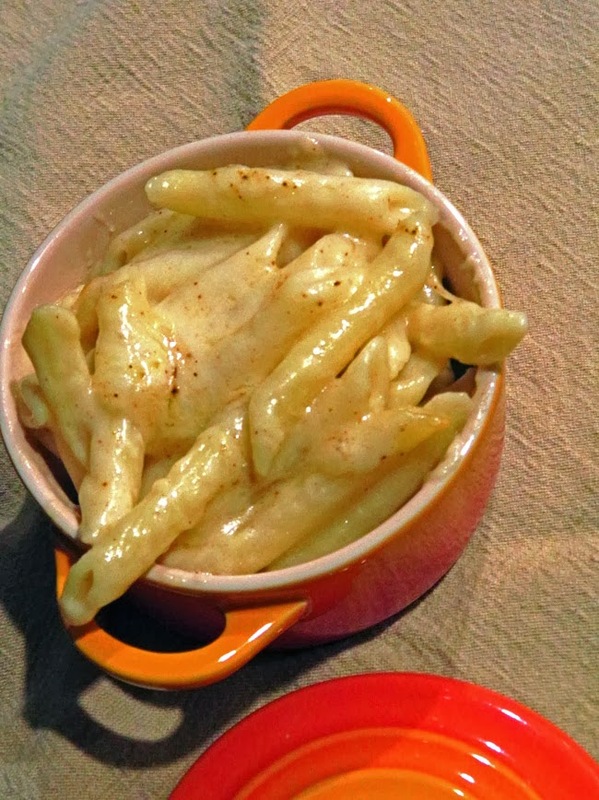 But I will leave you with the link for the Mac & Cheese. It's worth a try. Trust me on this. This past summer my husband and I were lucky enough to celebrate our 20th wedding anniversary in Palm Springs. Being in the Pacific Northwest we usually gravitate somewhere warm whenever possible. 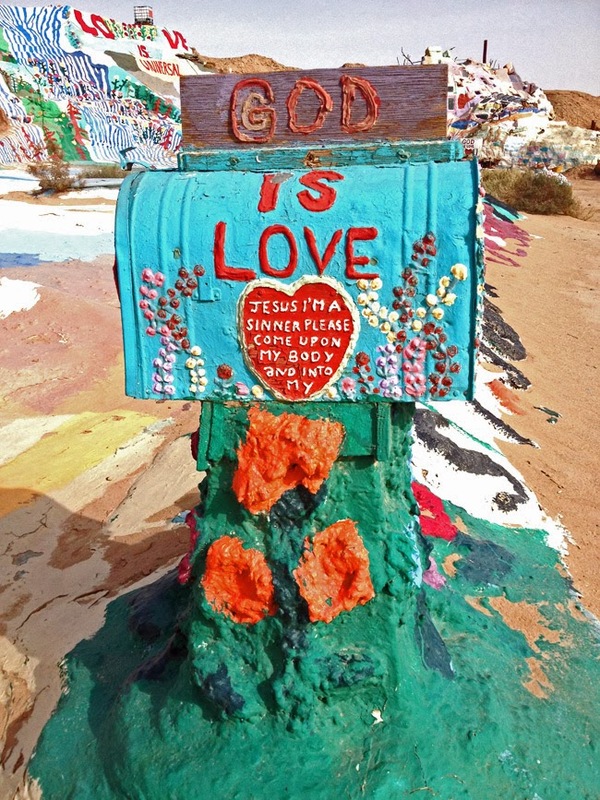 While there we were there we made the trek to Salvation Mountain and I feel so fortunate that we did. 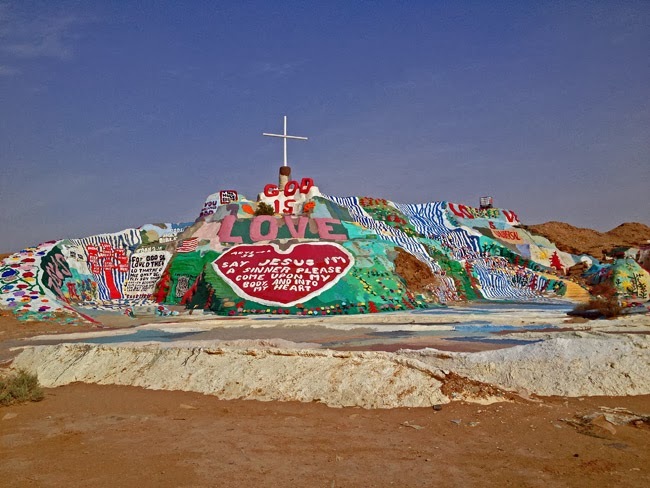 Salvation Mountain is the brainchild of Leonard Knight who just passed away Monday, February 10th. He wanted to create a monument to God's love, and despite the ravages of the desert, the opposition of men, and just plain running out of time he has created a monument to just that. Driving to Niland felt somewhat hazardous. We headed out on a windy, wild day into an area that was filled with ravines created by flash flooding. At some point we lost cel service and we were sent thru a customs checkpoint on the way back, even though we were not crossing a border. It was a bit harrowing and made us wonder about the wisdom of making the trip. But when we got there it was so worth it. There is something so incredibly moving about the place. The color, the size. It being in the middle of what feels like nowhere. And the open rooms full of prayers and notes from hundreds. I have to admit I spent the entire visit in tears. It felt moving and sacred. I have to say that it was entirely worth the visit and would encourage anyone curious to do so. It's an amazing story about having a dream, and making it happen. And loving God in the only way he knew how. You can find out more here. We have a daughter that will be spending Valentine's Day in Hawaii with her Grandparents so we did some celebrating early. 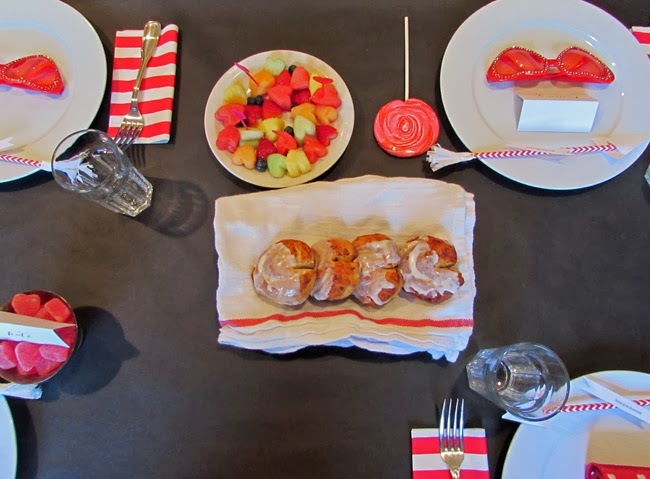 It's always been fun to celebrate with the girls by having little treats by their breakfast plates before school…which meant that they actually got a breakfast on those school days as well, rather than grabbing one on the fly (which was a gift in itself…I'm not always a morning person.) But this time I enlisted my husband to help with the meal and it went above and beyond. Let's just say that if it could be make in heart form, Steve figured out how to do it! You can't really tell it of the rolls, but we tried. And there was heart shaped bacon, but that was gobbled up too fast to get a photo of. 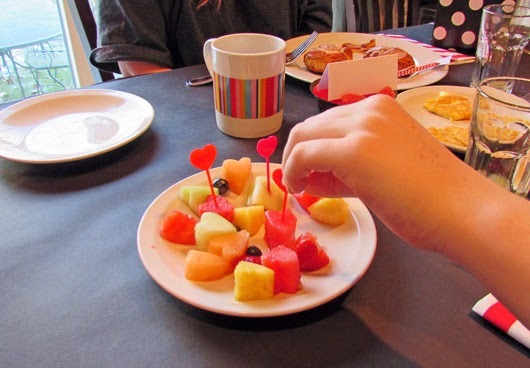 And then there was heart shaped eggs…which I didn't get a photo of either. But they were awesome! It was funny to see how far he would take it. Putting together this breakfast with Steve was so much fun. And doing things like this for my family is fun for me as well as them. The shopping, the planning, the event. 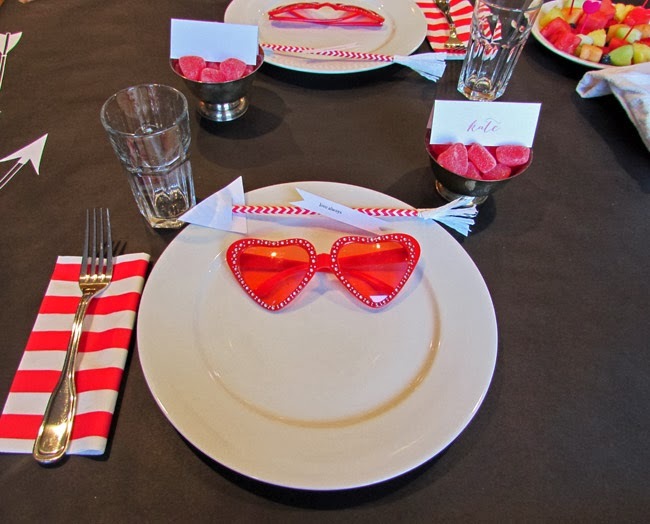 If they don't remember the funny glasses, the place cards (done by the lovely Brittney at Spruce), the chalkboard paper cloth, I do hope they remember the feeling of being loved & celebrated. So I have found you a place for a Valentine's date if you need one. It's a laundromat. Yes, I know but bear with me. I mean first of all look at that seating area. It's warm, rugged, and so Northwest. And second of all, it's romantic on so many levels. Let me explain. Maybe I should set the scene as to how a person with a lovely cherry red front loader washer & dryer ended up there. Our washer had been acting up for a while, then finally gave up the ghost. While the husband worked on it I decided to take all our laundry to this shiny new laundromat in town. Maybe the next photo explains a few things. Gross, right. But did you see the upper text? 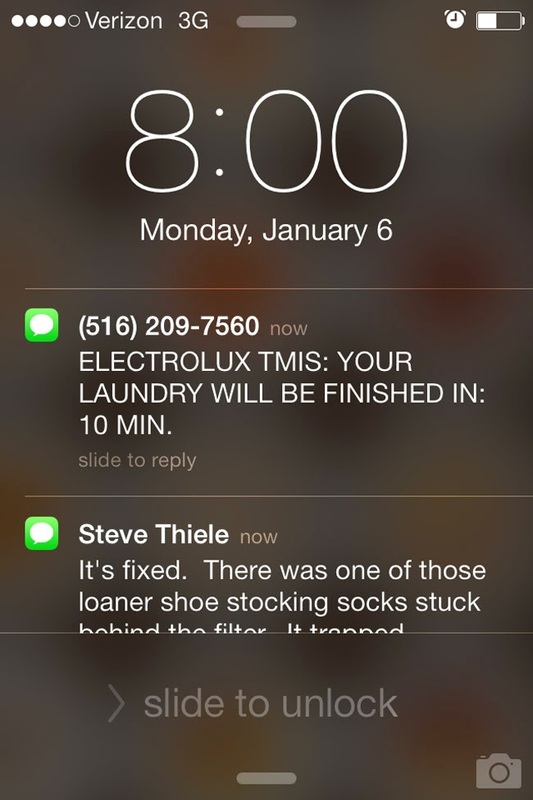 Oh, that was just a text from the washing machine at the laundromat! Yes, the washing machine! So amazing. 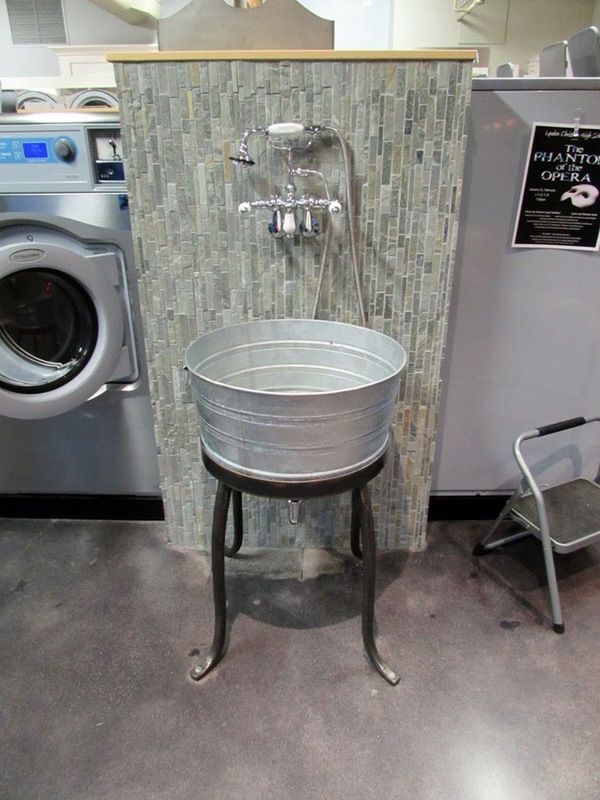 The tagline for Q Landry, is "The Laundromat for Busy People." So you get a text when your wash is about to finish, and then again when it does. There is even a bank of machines that go from wash to dry. And don't even get me started on the t-shirt folders they have available. Let's just say our youngest daughter may have a job waiting for her at the Gap. Oh yes. 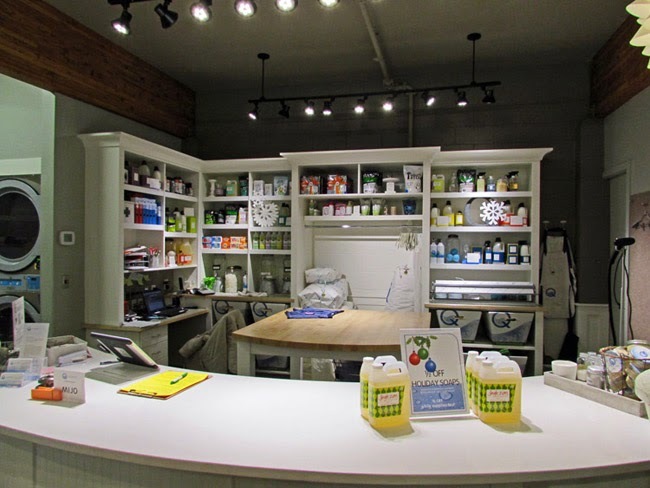 Then there is the detergent bar, full of range of lovely detergents such as Calendrea and even their own blends. You can buy a card so that you don't have to worry about coins. And there is even free wi-fi. Two thumbs up from all of us.